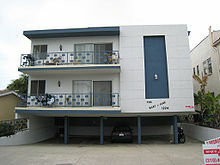 A dingbat apartment building in Southern California. A dingbat is a type of formulaic apartment building that flourished in the Sun Belt region of the United States in the 1950s and 1960s, a vernacular variation of shoebox style "stucco boxes". Dingbats are boxy, two- or three-story apartment houses with overhangs sheltering street-front parking. Mainly found in Southern California, but also in Arizona, Florida, Hawaii, Nevada and Vancouver, dingbats are known for their downmarket status and inexpensive rents. Some replaced more distinctive but less profitable building structures, such as single-family Victorian homes. Since the 1950s they have been the subject of aesthetic interest as examples of Mid-Century modern design and kitsch, since many dingbats have themed names and specialized trim. Dingbats are also reviled as socially alienating visual blights; California historian Leonard Pitt said of them, "The dingbat typifies Los Angeles apartment building architecture at its worst." From a structural engineering perspective, the "tuck-under parking" arrangement may create a soft story if the residential levels are supported on slender columns without many shear walls in the parking level. While the word is sometimes said to reference dingbat in the sense of a "general term of disparagement", dingbat refers to the stylistic star-shaped decorations (reminiscent of typographic dingbats) that often garnish the stucco façades. These flourishes and other ornamental elements reflect the contemporary but more complex Googie architecture. Dingbat building named "The Mary & Jane" with styled balconies. In a 1998 Los Angeles Times editorial about the area's evolving standards for development, the birth of the dingbat is retold (as a cautionary tale): "By mid-century, a development-driven southern California was in full stride, paving its bean fields, leveling mountaintops, draining waterways and filling in wetlands...In our rush to build we tolerated monumentally careless and unattractive urban design...Some of it [was] awful—start with the 'dingbat' apartment house, a boxy two-story walk-up with sheltered parking at street level and not one inch of outdoor space." 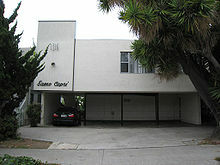 Geographer Barbara Rubin writes that since the existing housing stock of California bungalows, Mediterranean-style small houses, Spanish Colonial Revival duplexes and aging Victorians was insufficient, "a compromise capable of accommodating a marked increase in density, yet human in scale, and economical to construct, evolved by the early 1950s." This was the dingbat. Developers used the cookie-cutter, straight-line approach to building because simplicity and repetition held down costs, allowed economies of scale and required much less skilled labor than would curvier or more creative buildings. Land owners profited if they invested in the new apartment style and replaced one or two streams of rental income with triple or quadruple the number of units. Since each unit typically had a private entrance, stucco boxes offered an affordable version of the American Dream to city dwellers who aspired to owning a detached, single-family home, and with on-site parking, dingbats participated in the car culture of postwar American life. Rubin continues, "Inserted into empty lots or replacing the [existing] residential stock, the dingbat [was] a remarkably successfully transitional solution, the fulminations of architectural critics notwithstanding." Dingbats are primarily located in areas of a city that were (sub)urbanized or redeveloped in the 1950s and 1960s; city centers are generally free of them. Many are located on cheaper lots found near "locally undesirable land uses" such as sewage plants, power stations, jails or major freeways. The production of dingbats essentially ceased by the mid-1970s because they were "zoned out of existence when their signature back-out parking was banned by city ordinance". An unusual nonresidential use of the dingbat style can be seen in the Lackawanna, New York City Hall. Rectangular building fitted to its lot, with a decorative element. No entrances visible from the street. Unusual example with multiple types of ornamentation on one building. Dingbats, designed to maximize land use, stretch their footprints to the lot line and are typically 50 feet (15 m) wide by 100 feet (30 m) deep. Always cuboid, the stucco boxes usually contain six to eight apartments per building. Most dingbats are covered in stucco, sometimes along with other materials like vertical wooden clapboard, concrete blocks or river rock. The stilts that support the cantilevered portion of the building are generally made of metal or stucco-covered wood. 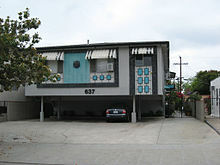 Two standard elements of the dingbat type are multiple entrances and the illusion of single-family residential density. The front of the building usually has one entrance or no entrances, presenting a unified front to the street. Typically, each unit is assigned a reserved parking spot; in some cases it is tandem parking. Some dingbats have studios; most are filled with one-or-two bedroom, one-bathroom units. As for their livability, Gary Indiana writes, "A bad idea run amok, these one- or two- (sometimes three-) story stucco shoeboxes that nearly everyone lives in at one time or another in L.A. have an existential emptiness that can be gussied up and dissembled by track lighting and the right sort of throw pillows and furniture, but the spatial insipidity of the dingbat eventually defeats most efforts to turn a 'unit' into 'home,' even when little sparkle lights enliven the façade." There is either no yard or small residual yards surrounding the building. The typically cheap construction means that the buildings may have a disproportionate number of leaky roofs (most dingbats have flat roofs where rainwater pools and can rot the outer roofing), yellowing walls, spotty plumbing or cheap wiring. The external ornamentation holds most of the aesthetic appeal that is to be found in a stucco box. Their dingbats, if detached, are collected by fans of the Space Age, Tiki and mid-century American design in general. Dingbats often have a name applied to the face of the building in cursive writing. Some used the name of the street (The Redondo sat on Redondo Avenue, etc.) and others referenced fantasy lifestyles and geographies: tropical paradises (the Caribbean, the Riviera, Hawaii) or stately dwellings of rarefied provenance (villas, castles). A Los Angeles Times reporter writing about a book devoted to the rediscovery of the dingbat noted, "Grandiose names—manors, arms, chezs, chateaus—abound. 'How charming is that?' [dingbat fan] Piercy asks, flipping to a big, numb box with Byron Arms printed above the doorway. 'Nobody in their right mind would think that Lord Byron lived there. It's lovely!'" Artists have recently produced series of dingbat photographs, some connecting images of their uniformity to the replicative pop art of Andy Warhol and finding that "the little differences between a monstrosity called the Capri and a twin called the Flamingo acquire the cachet of something like concepts." Others see a recognition of "individual dignity and communal worth" within the varied but conventional structures. A dingbat building in an area mostly inhabited by college students. Despite the stigma attached to them, dingbats are inhabited by a diverse populace who end up living there as a consequence of any number of circumstances. Some are there as a temporary situation, until superior housing opens up or becomes affordable, and some live in dingbats for years on end. In cities like Vancouver, B.C., however, there is little stigma attached to dingbat living, as the dingbat is present in almost all neighbourhoods of the city regardless of their general socioeconomic class. "[They] are not so much déclassé or redolent of actual poverty as they are an architecture of transience, of three-month leases or month-to-month rentals, in some ways ideal for the dicey professions so many Angelenos follow: illegal hair salons, "therapeutic massage" and a spectrum of feast-or-famine jobs in the entertainment industry, from acting to video editing. One can move from dingbat to dingbat on an income scale that slides up and down, and the very flimsiness of these buildings, which are usually supported on stilts on at least one side to make room for carports, encourages the idea that residing in one is invariably temporary, that the people inside are waiting to bottom out and segue to a Skid Row hotel, hoping for the right Richard Neutra to come on the market or looking for something in between—a guesthouse in the hills, a Silver Lake triplex with a long-term lease, a bungalow in Atwater Village." Their bare architecture and boxy appearance mean that dingbats are considered an eyesore and a demolition target in many towns. 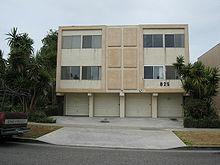 A city plan for Sarasota, Florida adopted in 2000 included a gallery of buildings found in the city, with only the dingbat being pointed out as an "undesirable" building type. Similarly, in 1999, the northern California city of El Cerrito published a master plan in which "Older 'stucco box' apartment buildings will be replaced with more up-to-date and better quality apartments and condominiums." Dingbats are decried by many urban planners due to their relatively lower densities and large parking areas, which reduces the attractiveness and usefulness of street-level pedestrian space. One design magazine states that, "The construction of one dingbat on a street of elegant rowhouses is enough to send property values plummeting," and subsequently calls for more form-based codes, a type of building-design ordinance that distinguishes between the aesthetic (and therefore socio-economic) value of dingbats and rowhouses. In 2016, authors Thurman Grant and Joshua G. Stein, in conjunction with the Los Angeles Forum for Architecture and Urban Design, published the book Dingbat 2.0: The Iconic Los Angeles Apartment as Projection of a Metropolis that details the historical, sociological, and architectural importance of the dingbats in Los Angeles. Grant argues that the dingbat “can be considered an icon of the 20th century, in all its kitschy glory", and that demolishing the buildings would remove an essential part of Los Angeles history. The columns used to hold up dingbat-style and soft-story buildings have been identified as vulnerable to collapse during earthquakes. 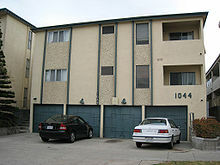 During the 1994 Northridge earthquake in Los Angeles, 200 soft-story residential buildings collapsed. Photographer Lesley Marlene Siegel has been documenting the Southern California dingbat in photos since the 1990s. Her catalog now comprises over 2,300 images and culminated in a 2003 solo show called "Apartment Living Is Great". Another Los Angeles artist, Clive Piercy, published a 480-image photography book the same year, entitled Pretty Vacant: The Los Angeles Dingbat Observed. In the 1998 film The Slums of Beverly Hills, teenager Viv (Natasha Lyonne) laments that her family is constantly moving from one dingbat to another. "Casa Bella", she says, surveying the stucco facade of a building the family is moving into, "another dingbat—that's what they're called. Dingbats. Two-story apartment buildings featuring cheap rents and fancy names. They promise the good life but never deliver." ^ a b Pitt, Leonard and Dale Pitt (1997). Los Angeles A to Z: An Encyclopedia of the City and County. Berkeley: University of California Press. pp. 110–111. ISBN 0-520-20274-0. ^ William Graf (May 2008), "The ShakeOut Scenario, Supplemental Study: Woodframe Buildings," U.S. Geological Survey Circular 1324, p. 12. ^ Banham, Reyner (1971). Los Angeles: Architecture of Four Ecologies (2001 printing ed.). New York: Harper & Row. p. 175. ^ "Dingbat", Oxford English Dictionary (1989), 2nd ed. ^ City of Los Angeles (2003), Draft Preservation Plan Workbook: Architectural Styles "Dingbat". Accessed March 7, 2009. ^ Editorial board (unsigned), "New development balance," Los Angeles Times, December 5, 1998, p. B-7. ^ City of El Cerrito, El Cerrito General Plan: Community Development and Design, August 30, 1999, PDF p. 4-7. (Accessed December 28, 2005). ^ Speck, Jeff, Making Better Places: Ten City Design Resolutions, January 10, 2005. (Accessed December 28, 2005). ^ a b Recinos, Eva (April 23, 2016). "L.A.'s Iconic, Hated Dingbat Apartment Is an Endangered Species". LA Weekly. Retrieved November 21, 2018. ^ Smith, Dakota (January 14, 2016). "Valley's dingbat apartment buildings will benefit from new earthquake law". Los Angeles Daily News. Retrieved May 9, 2018. ^ Kreuzer,Nikki "Offbeat L.A.: Dingbat Apartments—True Los Angeles Kitsch", The Los Angeles Beat, May 10, 2013. Piercy, Clive (2003). Pretty Vacant: The Los Angeles Dingbat Observed. San Francisco: Chronicle Books. ISBN 0-8118-4024-7. Siegel, Lesley Marlene (2003). Apartment Living Is Great. Melbourne, Australia: Outré Gallery Press. Grant, Thurman, and Joshua G. Stein, Editors (2016). 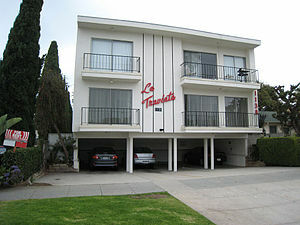 Dingbat 2.0: The Iconic Los Angeles Apartment as Projection of a Metropolis. Los Angeles: DoppelHouse Press. 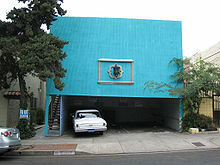 Frost, Garrison, Dingbat Living, The Aesthetic, date unknown, last modified April 2, 2005 (Accessed December 28, 2005). Noll, Udo, Peter Scupelli and gruppo A12, parole dynamic dictionary: dingbat, date unknown (Accessed December 28, 2005). Office of Historic Resources, City of Los Angeles, Dingbats, Preservation Plan Workbook, June 12, 2003 (Accessed September 7, 2009). Wikimedia Commons has media related to Dingbat (building). The Lower Modernisms: Introducing the Dingbat – May 30, 2011 by James Black.